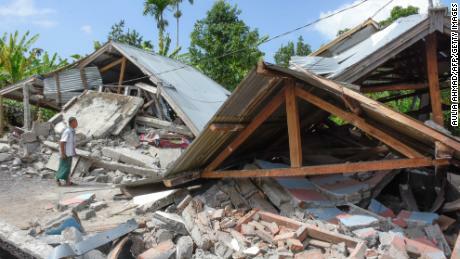 A local hotel owner told CNN many residents were still asleep when the quake struck at 5.45 a.m. local time Sunday (6:45 p.m. Saturday ET).At least 162 people were left injured following the tremor, 94 severely according to the Indonesian Red Crescent. 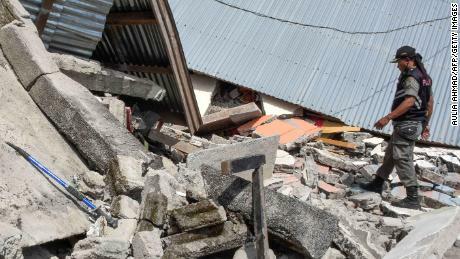 Indonesia is no stranger to destructive earthquakes, sitting on the area of intense seismic and volcanic activity known as the Pacific Ring of Fire.The 40,000 kilometer (25,000 mile) area stretches from Japan and Indonesia on one side of the Pacific, all the way across to California on the other.But Jean Paul Volchaert, who owns Lombok's Puncak Hotel, said it was the strongest one he had felt in his time on the island.Videos provided to CNN by a Thai trekking group, Trekmania, who were on Mount Rinjani when the earthquake struck, showed enormous clouds of dust covering the slopes of the mountains, triggered by landslides. Among the dead was a 30-year-old female Malaysian tourist, Antara said, who Malaysia's Deputy Prime Minister Wan Azizah Wan Ismail mourned in a statement Sunday.Deputy Head of Mission Zamshari Sahaharan at the Malaysian Embassy in Jakarta said they were encouraging all Malaysian who knew tourists in Lombok to contact consular officials.He said the Malaysian government was ready to provide further aid to their Indonesian counterparts as necessary. 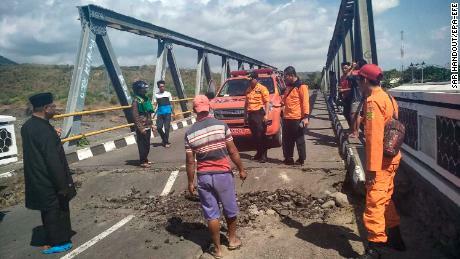 Indonesian Red Crescent said it had almost 100 volunteers on the ground in Lombok, delivering aid to residents recovering from the disaster.Hundreds of blankets and hygiene kits were being distributed as of Monday, according to the group, along with 1 hundred million rupiah ($7000) in emergency funds.The Indonesian government has been working to supply mineral water, tents and food supplies to the affected, according to Antara.